Cebu Pacific Promo Fare: SALE it with a Kiss! Low, low fares you shouldn't miss! Our latest #CEBseatsale is up. 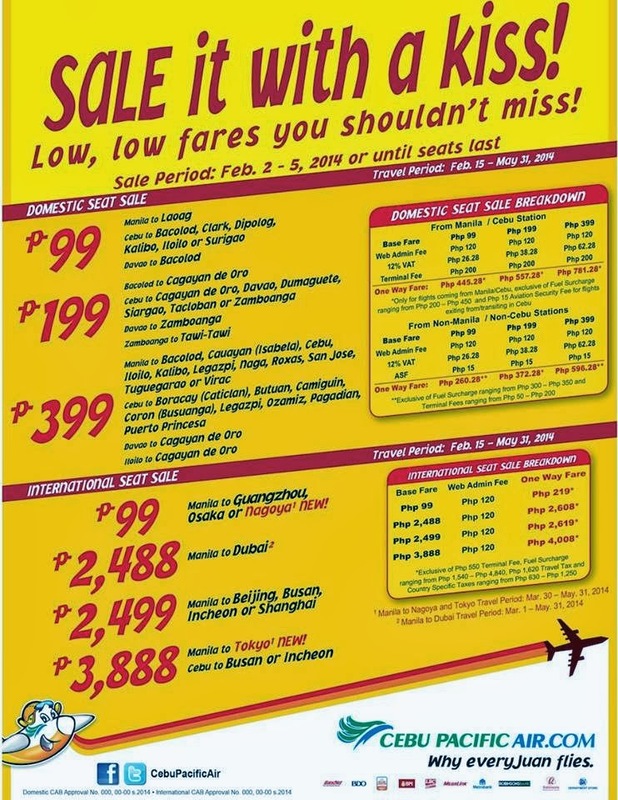 At the start of February, Cebu Pacific is offering you some very low BASE FARES that your can grab. Please mind of the travel dates. This one will cover until May 31, 2014. This is perfect to visit places like Laog, Surigao, Bacolod, Dipolog, or Kalibo. You may plan to visit the pristine waters of Boracay via Caticlan flights too! Or you go south like Cagayan de Oro, Zamboanga, Tawi-Tawi or Davao. Some spots in the Visayas are also good places to visit like Dumaguete, Masbate, Cebu, Iloilo. Promo Price is for the BASE FARE of a single trip ticket only. Passengers are allowed to hand carry luggage up to 7 kilos only. Check in Baggage Service service is availble but with a fee. Tickets can’t be re-booked or be used by another person. Do you still have slots for april 2 2014 for 9 persons? manila to butuan meron ba? do you have any promo fares in April from Cebu to Manila? what about Clark to Singapore? May dipolog to cebu bah? Bakit may terminal fee?last 2013 umuwi po ako dyn sa pinas nag book po ako online and i also pay terminal fee that time,bakit nung nasa airport na ako siningil ako uli ng terminal fee?please explain..
helow po mron po vang promo manila-davao?? how much po.. thanks..
Meron po kau busan to manila . Manila to busan s dec po to jan 2015?? manila to gensan meron? if any how much? wala po bang manila to surigao? ?promo po? Magkno po mnla to bohol roundtrip?slmt po. Mai manila to davao po ba? Magkano po? still open pa po ba itong promo na ito till now? Promo Fare For Php 28 only! 90% Off in All Domestic Flights! Valentine's Day 2014 Promo Sale! Promo Fare of P99 As the cheapest you can get! Juan For Fun Season Starts! Promo Fare 2014: 75% OFF!